Surfing Bali - a modern day oxymoron? Don’t get me wrong, the culture and people are still amazing and there are great waves if you want to endure forty minutes taxi each day from your Kuta/Legian resort complex. Unfortunately you will more than likely arrive to share the popular line ups with an international cast of pro’s, semi pro’s and wanna-be pro’s. Plying oneself from the tangled mass of punters at peak hour on any given break is not my cup of Bintang. We opted firstly for something around Canggu, a well known swell magnet that’s home to quality left and right breaks. It was here, tucked away down a roughshod driveway 300 meters from Perenan beach we found Andy’s Surf Villas. 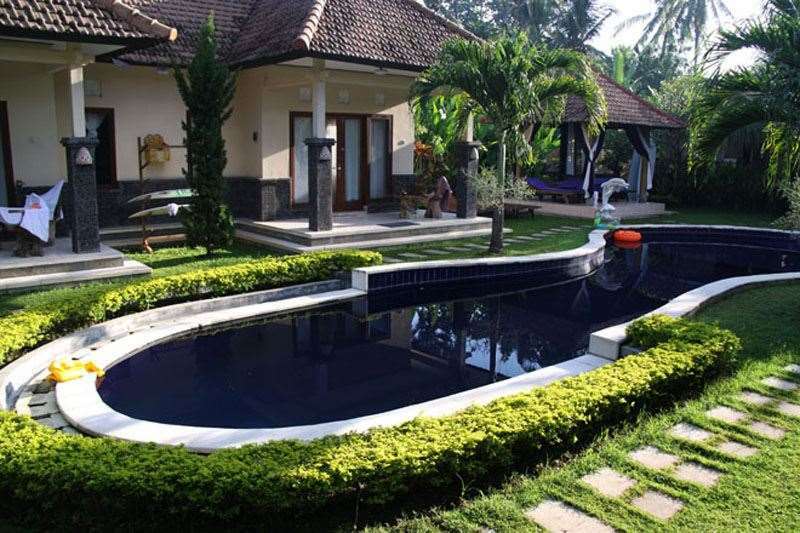 There was nothing from the entry that suggested how beautiful this quaint set of 4 Villas are and you could understand how something like this would be kept secret by people only in the know. Australian Andy Young owns the Villas that were completed only two years ago and has really created something that he says “he would want to stay in”. The attention to detail in the traditional Balinese wood work that makes up the gazebo style villas is eye-catching and the meticulous garden surrounds really makes this place feel like a private oasis. The Villas are comfortable. They are fully air-conditioned with a bar fridge and all have ensuite bathrooms. They are laid out around a shared plunge pool and BBQ/ bar area. The main villa sleeps 4 and has a full Kitchen and lounge room with TV, internet and DVD player whilst the other 3 are all doubles. A full time caretaker looks after anything you may need and security is provided through the night. This place is hard to beat if you are in a group with family or friends, all the same there is enough privacy for singles and couples as well. A quality local Cafe on the beachfront 2 mins walk takes care of your food needs and you can also buy groceries to whip something up in the BBQ/ cooking area. The surfing is great, you can just see the conditions from the balcony of the main villa and without much effort it’s easy to be the first person in the water and the last one out and the plunge pool and a cold Binny only 2 mins away...well it doesn’t get much better than that. Our second stop was on the other side of the Island at the infamously crowded but unbelievably epic wave of Keramas. There isn’t much accommodation at Keramas or even nearby, not yet anyway. Keramas is a good 20-30 mins North of Sanur and a mind numbing 40- 50 minute jostle from Kuta. 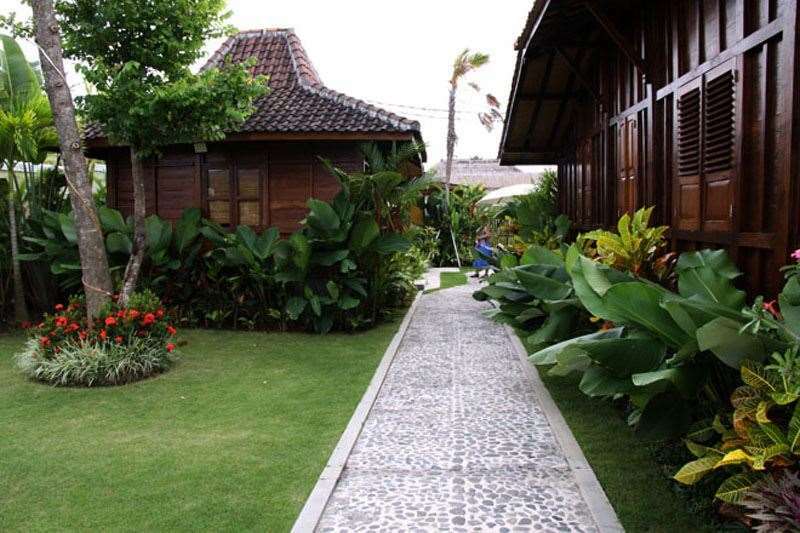 We found Nomad Surfers resort, a small Villa complex within walking distance to Keramas. (10 min walk up the beach 2 min by taxi) What we first noticed on arrival is that we were going to stay in what felt like an untouched part of Bali. The resort, 300meters down a small road off the newly constructed main road was set in dense jungle with a clean organic smell that was different to the smells in the more populous areas; “there are going to be mozzies the size of small aeroplanes” was my simplistic initial evaluation. The Nomad resort consists of six independent double and single villas that, although a little older are very clean and well looked after. They air-conditioned with ensuits and sit within a walled complex that’s nicely landscaped and maintained by the live-in family. There is a pool and games room and the full time chef feeds everyone in an open common area with views of the jungle and surf. A TV and games room is great for down time or if you have kids and open gazebo’s with sun lounges beside the pool ensure your missus can kick back comfortably while you are surfing.